From the moment the pregnancy test reads positive, we quickly envision the best of all possible worlds: minimal sickness, a cute baby bump, and a delivery that’s both easy and on time. But life has a way of laughing at our expectations. More often than you might think, moms find themselves in the delivery room long before their due date. It’s a reminder of the uncertainty of life, and with that in mind, parents might choose a special name for preemies that reflects just how special they are. Giving birth prematurely, which is defined as any time before 37 weeks of pregnancy, occurs in one out of every 10 births, according to the Centers for Disease Control. A number of factors can raise the risk of prematurity, including age (teen moms are more likely than adults to give birth early), carrying multiples, and lifestyle choices such as smoking and drinking during pregnancy. 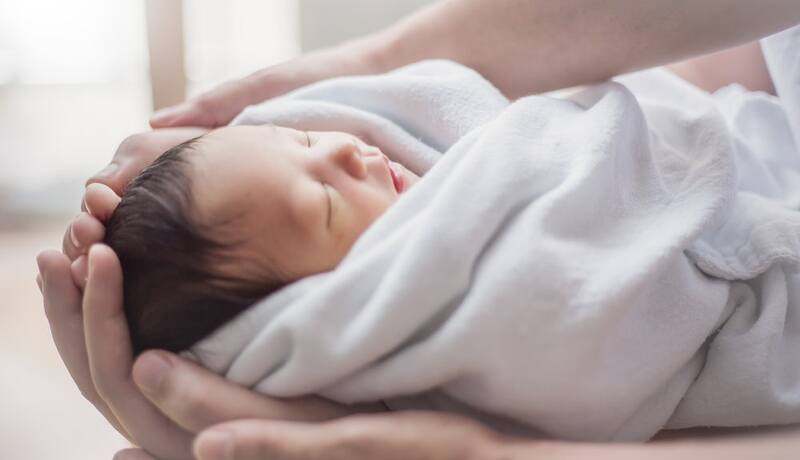 Babies born prematurely can have breathing, vision, and hearing problems, according to the March of Dimes; they’re also at greater risk for developmental and cognitive delays, but that’s not to say that every premature baby will have these conditions. Parents of preemies quickly learn never to take anything for granted. If you’re a member of this not-so-exclusive club, picking a baby name to match the gratitude and wonder you feel is a logical and beautiful choice. These are just a few of the possibilities out there; do any strike a chord with you? This name says it all, and it’s a natural for a baby whose very presence on Earth was against the odds. Whether or not you’re a fan of Ms. Kunis, this pretty name is appropriate for a preemie daughter; it’s the diminutive of Milagros, the Spanish word for “miracle,” per The Bump. The Greek variant of the Hebrew name Yitzhak, meaning “he will laugh,” Isaac has been a popular choice of millennial parents, according to the Social Security Administration. What makes it fitting for a premature baby is its Biblical association: Isaac was the miraculous son born to the matriarch Sarah when she was long past childbearing age. Another Biblical name, Jesse is Hebrew for “gift,” explained Nameberry and parents of preemies would certainly agree that their baby is all that and more. Regardless of your particular faith, this is a lovely name that also happens to be the name of the patron saint of infants and premature birth, according to Catholic.org. Slightly less old-fashioned than Benedict, this is a variation that also means “blessed,” per Nameberry. A popular name through the ages, Matthew always sounds good, and its meaning “gift of God,” according to Baby Name Wizard is even better. Even if you’re not a Goop follower, this Welsh name meaning “blessed” per Namberry is still a pretty name for any baby, but especially appropriate for a preemie. Pronounced mee-RAY, The Bump describes this French name to mean “wonderful,” “peace,” “prosperous” or “admire,” all of which fit a little one nicely. For Italian families (or just families who adore Italian names), this name meaning “blessed” should be on your list, per MSN. BabyGaga pointed out that this name means “she who brings happiness.” The happiness will only increase and multiply when you bring your baby home from the NICU. Small but strong, like preemies themselves, Namberry said this Norse name means, simply, “hope” something you’ll need a lot of if your baby’s early arrival is concerning. A literal but powerful name, Faith is an ideal pick for parents whose beliefs give them strength during challenging times. Another name meaning “faithful,” per BabyCenter, this boy’s name would pair well with Faith if the preemies happen to be twins. This Latin-derived name means “faith” or “truth,” said The Bump. Either way, it reflects the trust parents have that all will be well with their early-born child. A lovely and unusual name, Harika is a Turkish name meaning “miracle,” according to Nameberry. A miracle baby could be named after this French town famed for the miraculous grotto where St. Bernadette is said to have seen the Virgin Mary. Not to be confused with a dog’s sound, this is a beautiful African name meaning “blessing,” per Babynamespedia, and it’s actually two syllables. An Arabic name meaning “faith,” according to Nameberry, this is an interesting alternative to other faith-themed names. To reflect your awe and belief in the Almighty, you could choose this female variant of Michael, meaning “who is like God,” per Baby Name Wizard. Greek for “God’s gift,” explained The Bump, this is another of the many “gift” names you can bestow on a child. This Japanese girl’s name means “child of joy,” according to said The Bump, making it another excellent match for a premature baby. Every parent has hopes for their child, but parents of preemies have even more reason to hold on to their hope that their baby’s arrival is just an early start to a long, healthy, and happy life. Naming a child Hope is a permanent reminder of that optimism. After a very frustrating first birth experience, this Deaf mother wanted a change. Will the help of two Deaf doulas give the quality communication and birth experience this mom wants and deserves? Watch Episode Four of Romper’s Doula Diaries, Season Two, below, and visit for more episodes.